British hedgerows have been embellished with juicy blackberries this Autumn and foragers have braved the wind and cold to collect these seasonal gems. During my weekends back to Somerset I spent many afternoons precariously balancing on hillsides surrounded by prickly brambles determined to collect enough for a few scrummy bakes. The endless scratches and blackberry ink stained fingers were completely worth it once I’d arrived home with bags full of berries. I removed the stems and gave them a thorough wash before putting them in the freezer. Blackberries can be frozen for up to a year which means blackberry crumbles will be on the menu through the summer. I also gave some to my Grandad who is making some blackberry wine – yumyumyum! I decided to try this very simple, yet superbly delcious recipe with a small portion of the blackberries. 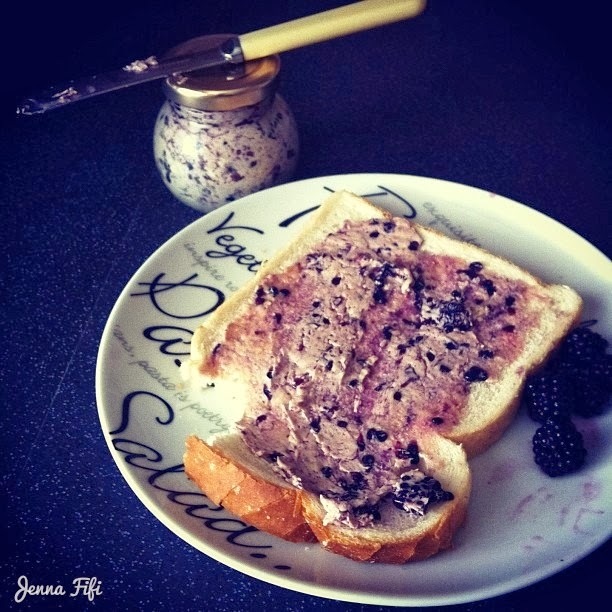 Its lovely on toast in the morning and makes a refreshing twist to the usual bread and butter. I plan on making some more in the warmer months so I can take it on picnics 🙂 Little jars of these wrapped up with red velvet ribbon will also make the sweetest gifts at Christmas! How perfect to have Christmas morning, or on boxing day! Mix together the butter and the honey using a hand whisk until it is well combined. Add in the blackberries until you reach the colour and consistency you want. Store it in a jar and keep refrigerated. Enjoy on warm toast with a cup of tea! That looks delish! unfortunately we don't get blackberries here but might try this with other berries.